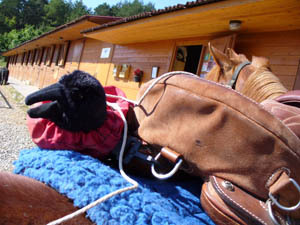 Merri Travels on Endurance.net: RAVEN II RIDES SPAIN! The boys working for Bernat saddle up the chestnut gelding Amazhig for me, I tied Raven in his bag onto the saddle, and off we went for a ride in the pre-Pyrenees mountains of Spain! Mine was a nice horse, very smooth, very responsive. I think he liked me because I scratched his ears, which were so terribly itchy his eyes rolled back in his head as I scratched this insides. 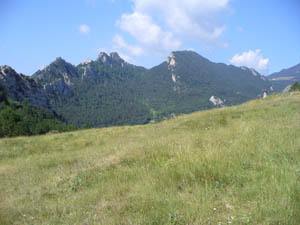 We started walking up and up, up 'logging roads,' part of them connecting with a hiker/trekker trail that runs about 100 miles, and will take you through the Pyrenees into France. I quizzed Bernat while we rode, continued picking his brain. How does he train? It depends, of course, on the horse, what race is coming up, how the horse is feeling and training. But in general, he might take the horse out 2 days on, 2 days off. If a 160 km ride is coming up, he might take him out on a long ride that week before. Just depends on the horse. What about electrolytes? 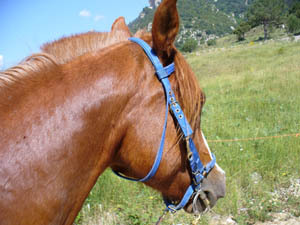 In general, he doesn't use them, but always, he listens to his horse and what he might need. He prefers to feed carrots and apples – natural things, and he will sometimes use the flora stuff for helping settle the stomach. But again, it just depends on the horse, and the day, and the ride, and each loop. Feeding during races: he likes to take many different things for the horse to choose from. Ever notice how your horse will always try to eat some other horse's food? It's probably because the horse knows he needs something else that food might have in it. Or maybe he just wants a variety and he'll eat more if he has all the choices. Bernat observed that some horses and riders or trainers just don't get along – it's just like people. You might see someone on the street, you don't know them at all, but you just get a feeling about them – ew, he's a creep, or hey, that must be a nice person. And when you meet them, same thing – some people you get along with famously, and some you just don't get on with at all. And it's the same with horses and people – sometimes they get on fine, sometimes they don't. The horse Shaman that won Florac came from a trainer that wasn't getting anywhere with him. Shaman and Cecile Demierre obviously hit it off! 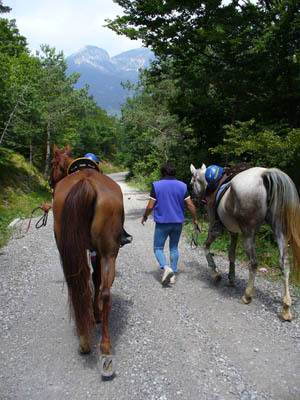 Our 4 horses had a good walk up, some of it steep, some of it on trails through the green rich forest, and when we got back onto a dirt road, we started trotting, switching-backing up and up, and the last few stretches we picked up a canter. 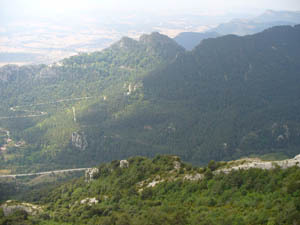 My horse loped smoothly along, both of us squinting from the rocks flying up from the feet of Bernat's mount as they pelted us in the face. Up to the top we cantered, the top o' the world, where we had 3 directions of the compass spread out far below us – it was hazy/smoggy, but bello – beautiful! 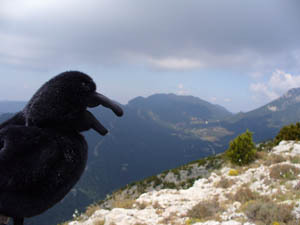 The Raven enjoyed the view too, and, I saw a couple of vultures hanging high in the wind updrafts. We walked the horses on foot all the way down – the road was slick, and hard – no need to stress their joints riding them down. 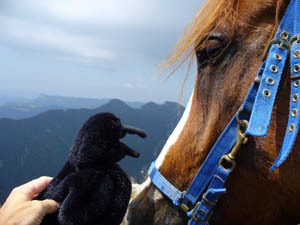 The Raven had a great time, and I gave my mount some more good ear scratches in thanks for the lovely ride. After the ride, Neus served us and 3 children lunch (made and delivered by a woman in the village, because Neus doesn't have time to cook lunch and dinner for everybody). And that Neus, you have to watch her carefully, because she PILES the food on your plate! She has this sneaky way of dumping more and more food on your plate, and if you don't watch every second, she keeps piling more on! And when you grab for your plate, she pulls it back out of your reach and puts MORE ON! When you object, she keeps PILING IT ON! She did tell me that the cook way overcooks – she tells the cook “food for 4” when there are 6, or “food for 6” when there are 9, and the cook makes enough for 12 people – so maybe she doesn't want the food to go to waste, or she just wants to put meat on everybody's bones! I sat down with my computer afterwards to write, I really did, but Neus said “Would you like to go riding with Bernat again?” Sure! So i put my computer away... but nothing was happening yet, Bernat was off doing something, so I laid down under the tree, near where Neus was reading a story, or telling a story to the kids... not sure because I dozed off for a Siesta... and sometime later Bernat was standing over me, “Hello!” “Uh – huh? What...?” “You want to go riding?” “Uh – yea!” “It's OK, we get the horses ready, you sleep 5 more minutes.” Oh no, I couldn't be such a Princess; I got up, though it took me a good 4 minutes to actually perform that function of getting up and staggering to the stables. I like the Spanish Siesta – especially when you have someone like Neus loading you up with a big lunch! 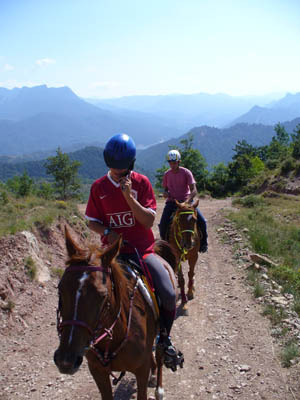 I was given an appaloosa to ride – one of the lesson horses. “He has a head like a stone,” said Bernat. I got on to test the stirrups, and the horse started walking off, and I couldn't stop him because he had no brakes. Yikes! One of the 2 other boys was riding a chestnut (“sometimes, he likes to buck a little”) and Bernat was riding a crazy gray horse, and I got the kid's lesson horse. Who was excited as we left the property. In fact, I could feel him a bit humpy beneath me, shaking his head at times (I wasn't on his mouth at all), and wanting to put his head down. Hmmm. He did get his head down once, but we were walking, so I got it back up, but I was quite alert to anything he might try. He was quite jittery as we started climbing up a long steep hill, but even that didn't knock the wine and vinegar out of him. 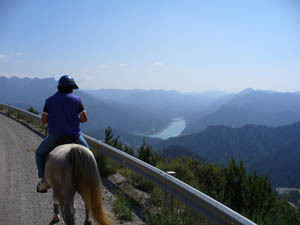 He was huffing and puffing mightily behind the endurance horses as we finally climbed up onto the 'logging road' we were on yesterday. Bernat said, “We will trot some here,” and I could still feel the little Appy lesson horse ready to erupt or do something naughty beneath me. We started trotting along, in the middle of the string, and he'd give his head a shake, and start to put it down, but I'd check him, and then suddenly it happened: he leapt up, threw his head down, and propped! “ACK!” I squawked. The boy behind me pulled up, and Bernat watched in wonder as the little lesson horse almost bucked me off! My right foot came out of the stirrup, and the things that saved me from coming off and being totally embarrassed by the kids' lesson horse was that he didn't get his head all the way down, and he stopped after that one buck. Yahoo, I stayed on! Normally I fly right off a bucking horse before he gets past the first buck. Bernat was appalled that the appy bucked (“he's never done that!”) but I was thrilled I stayed on (luck really, no skill involved). Bernat said maybe the other horses excited him, but I said no, he'd been that way since we left. Who knows, maybe the horse and I just didn't connect, like he'd been talking about. Or maybe his girth was too tight, or he didn't like the way I sat, or maybe he didn't want to leave the house (though he does, on rides like these), or he didn't like some of the horses he was with (he definitely didn't like one of the chestnuts), or maybe he just had a bee in his bonnet today. I said, “I know! The other horses were calling him names and he was embarrassed by it!” I was making a joke, but Bernat didn't get it, and I had a hard time trying to explain, in English and my limited Spanish. After that buck, we walked some more, then tried trotting again. Maybe the appy got it out of his system, because he wasn't so naughty, though there were still a few moments where he thought about trying it again. 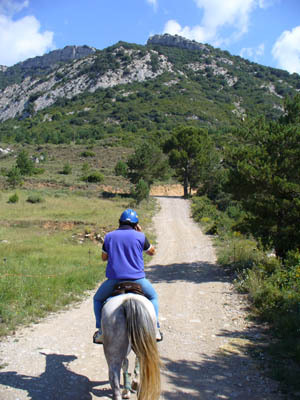 But then, up we started climbing on a hard trail, trotting, up and up. His little legs spun and spun to keep up with the long-stepping Arabians. This finally knocked the stuffing out of him! He couldn't have bucked if I'd started spurring him and goosing him in the flanks. Which I didn't do, even though he'd been naughty. Sometimes a horse just has to buck. We climbed up a little more, up onto a flat above the forest where a lake used to be, and where cows now grazed – nice little spot up on a little top-slice of the world, with a view across to the top point we were at on this morning's ride. 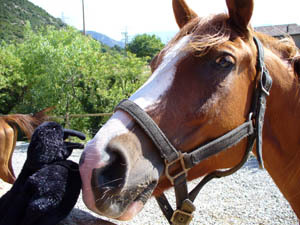 Bernat's horse didn't like cows, so he worked on a little up-close-and-personal bovine time with him. 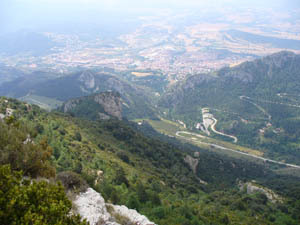 Then we headed down, getting off to walk again down the slick rocky roads. My little appy strolled along beside me, and I grabbed a few branches off some sort of bush that the horses liked, handing them to him to snack on as we went down. We got back around 8 PM, still plenty of light, and then it was a semi-frenzy of loading the kids and all our suitcases into the SUV, and taking off up the 'logging' roads for another place a few kilometres further into the forest, where the Casals rent property, a house, a type of hotel/hostal for families, a barn converted to a type of trekker's rest, and a barn where Uri kept his horses. 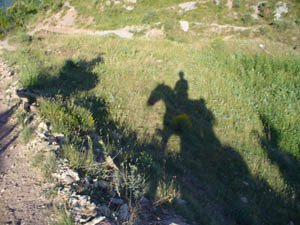 Bernat and I didn't fit in the SUV so I rode with him on the quad to the place. There we all spilled into the house-barn, which quickly echoed loudly with 6 giggling, screeching, laughing, playing kids. Neus dished out the spaghetti, and here she went again, piling the food on, more and more until you almost had to tackle her onto the ground to stop dishing it out! The giggles and screeches went on throughout dinner, and ohmigod it was deafening echoing around the building, and Bernat teased the kids and shook his head, “Ay yi yi!” as the kids' squealed some more, and Neus kept dishing out the food! I thought ohmigod we'll never get any sleep, this will be a big all-night slumber party with the kids, but, just like Bernat said earlier, when you say QUIET! with a stern look on your face, the kids get quiet and they go to sleep (not to mention they are probably tired from the riding and being outside all day then playing hard together inside!) A couple of them whispered, and Neus said “SHHH!” and the shhshed, and they went to sleep, and so did I, slept like a log!